Marlie and Me: Enter to Win $74 Worth of Prizes in the #GreenChristmas Gift Giveaway! Enter to Win $74 Worth of Prizes in the #GreenChristmas Gift Giveaway! I have a couple of great green gifts for the eco-warrior on your holiday list! A ReUsies two-pack and a trio of Mira Mariu mineral makeup products! Welcome to the Green Christmas Giveaway Hop, hosted by Happy Mothering, Going Green with Grizls and The Reynolds Mom. 50+ members of the Green Moms Network have come together to offer you tons of chances to win green-themed Christmas gifts! There’s sure to be something for everyone on your list. We hope you’ll discover some great new brands to add to your Christmas list too! 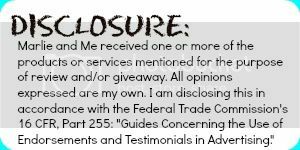 Below my entry form, you'll see the other giveaways to enter as well as information about entering to win the Grand Prize! ReUsies reusable snack and sandwich bags in your choice of design. $16 value! Read My Review. Mia Mariu Perfect Finishing Mineral Primer, Mineral Concealer and Mineral Cream Foundation in your shade. $58 value! Read My Review. Our hosts are featuring 5 fabulous grand prize packages from these green and natural brands: For Your Bug-a-Boo, Blue Manatee Boxes, Bulk Herb Store, Snug Bug Diapers, Nosefrida, My Pretty Playhouse, Wonder Forge, Kelly Kits, Kerrific Online, LibreTea, Grounds for Change, Zulka Sugar, Justin's Nut Butters, Better Life, ReuseIt, Strawesome, generationMe, Soybu, Purely Gorgeous, A Mothers Design, Dr. Bronner's and Xmittens! Click here to enter the grand prize. This promotion is in no way sponsored, endorsed or administered by, or associated with, Facebook. You understand that you are providing your information to Happy Mothering, Going Green with the Grizls and The Reynolds Mom, and not to Facebook. Please note that Happy Mothering, Going Green with the Grizls, The Reynolds Moms and the Green Christmas Gift Giveaway bloggers are not responsible for sponsors that do not fulfill their prizes. We have represented each sponsor with the expectation they will fulfill their prize and in a timely manner. We will contact the sponsor regarding your prize(s). The sponsors, in most cases, are shipping their items to you directly. We will make every effort to assist you obtaining your prize. If there is an issue with a sponsor, please notify the blog you won a prize from within 4-6 weeks for assistance, after that we may be unable to assist you. I like the peace flowers. I love the Little Green Monsters print! I like the Happy Fruit pattern. I love the Little Green Monsters! Superpoints put out notice today that they are suspending operations. I really like the arabesque print the best. I love the Arabesque design! My son would love the camo print. I like the Whooo's Looking Owl print! I like the Little Green Monsters print. I love the Arabesque pattern! My favorite is the Arabesque print. I like the Little Green Monsters Two Pack. I like the Aaarf design. Arabesque is my favorite design. I like the Arabesque Large Reusie. It matches my work bag. The peace flowers design is my favorite...Thank you for this contest and Wishing you the happiest of holidays! Little Green Monsters pattern! they are cute!